How high are those contrails? That’s a very important issue if you are investigating the science of contrail formation. I’ve been thinking for a while that a good method might be to take photos at a plane at a known focal length on a digital camera, and then by measuring the pixels of a known dimension of the plane (the length, or the wingspan), then you could calculate the height. So I was delighted to find that someone had already done just this, in an article titled: “Points to Ponder: Calculate the altitude of aircraft using a digital camera” (http://archive.is/kUvsB). They had worked out the math, and even given a little calculator. So using this information they calculate the height of the plane at 20,000 feet, which they then claim is too low for contrails to form. Obviously it’s not, but that’s another matter. Let’s focus on the accuracy of this calculation. Note this matches a lot better than the KC-135. In particular the size of the engines is a far better match. The KC-135 engines are proportionally far bigger. The width of the plane around the nose fits a lot better. The wing angle also matches the 747 better. You can easily see it’s far more like a 747 than a KC-135. With this better fitting plane, which has a wingspan of 211 feet, the corrected altitude would be 20000*211/131 = about 32,000 feet, roughly the cruising altitude of a Boeing 747. To further test the accuracy of the calculation here, I calibrated my own camera at 85mm zoom (effective 136mm) by photographing a 12″ measure at a known distance (518.3 inches, laser measured) away. This came to 295 pixels. I then used this to calculate the focal length in pixels of my camera (295*518.3/12 = 12741 pixels). The focal length in pixels (f) gives you an easier method of calculating the distance (d) from image wingspan pixels (p) and wingspan in feet (w) , as it’s just d = f * p / w. I used this on a photo of a plane taking off from LAX, a known distance (4.5 miles) away (using length instead of wingspan), measured 82 pixels, and came up with a length of 151 feet (about a 737). Finally I fed everything back through the calculators supplied in the above article using their focal length & HFOV calculations , and I got back the correct distance. So, the math is all sound. The problem is picking your reference measurement, for which you need to correctly identify the plane. This can be quite difficult, so you should use the longest physical zoom your camera has. Most small cameras don’t have the zoom, you really need something like the equivalent of 300mm on a 35mm camera. (200 mm on a 1.6x multiplier SLR). Preferably longer. Another thing to consider is that this gives the altitude above ground level, and the important altitude is above sea level. So if you are in Denver, add 5,000 feet, if you are in Leadville, add 10,000. Be careful not to read too much into your snapshots from the top of Mammoth Mountain (11,000 ft) either. Another important consideration is that the altitude is only entirely accurate when the plane is directly overhead. Consider the following images, all taken at the same magnification. In each of them the plane is at the same altitude. You are absolutely right with the B747-400. So, Brian Holmes KC-135 story at 19,660 feet is nothing but a white lie. Fascinating. They basically did the same thing I did, but over a year ago. Drat. That’s just goes to show the stickiness of the internet, where things can be easily debunked, and yet still hang around. It’s probably been debunked somewhere in English as well. I am actually writing a blog on this same story. You will notice that the plane is actually an All-Nippon 747-400. You will notice the red dot underneath the right wing. How many US KC-135’s have a Japanese flag underneath their wing? People are so ignorant. Heh, I never paid the red dot much attention. Thanks for pointing it out. posted Mon Apr 30, 2007 10:15 pm. And Ryan, great job about this whole thing on your blog – I’ve left a message there. Another problem is that people who blog, post and write that contrails are simply a consequence of the thermodynamics of water are labeled as shills, trolls and part of the conspiracy. I found this all very interesting, especially the information on finding the height of a given contrail by this pixel measurement method, however that’s where my interest ends as I found the rest of this article, if I can call it that, a bit of self-serving propaganda which seems to be all meant to discredit this Brian Holmes, who if I’m not mistaken was the one who first posted this method of digital measurement. I find It rather disingenuous that the topic moved so quickly from a discussion of measurement to one of personal attack, it’s obvious that there is another agenda at work here and one not related to contrail science at all. Personally I do not know if the plane is a KC-135 as Brian Holmes states or if it is a 747-400 as you seem to believe it is, I believe that neither party has proven what type of plane it is but you certainly have succeeded in detracting the readers attention form the original subject which you presented as being ” Measuring the height of contrails ” but then I assume that was you’re intention all along, correct? I find the chemtrail Vs. contrail people a lot like the Republicans and Democrats with far leaning people in both camps, I believe that there is justifiable validity to the chemtrail issue but there is some wild speculation going on about it by some which makes all look like a bunch of loony conspiracy nuts. That said, I believe that there are those in the opposing camp that are so ridged and inflexible in there beliefs that they are treating this chemtrail issue with blinders on and their heads firmly stuck in the sand. you seem to be of a mind of the latter, maybe you should step back and loose your obvious bias and take a serious look at the subject from neutral position as I have and perhaps you will gain a better perspective about it rather than one of outright condemnation. You seem intelligent, do you have any idea of the horrendous things that the government has subjected the population to, done in secret over the years, if they are spraying these chemtrails, it would not be the first time that they have decided to subject the people of this country to nuclear, chemical or biological experimentation but then, if you’re as intelligent as you seen to be, you already know this to be true but no doubt would like to believe that our government would never do something like that again and again and again,etc, etc. Please, take the blinders off, there is a far wider picture to be seen to all of this than you are presenting here but then again, I think you already know that, right? Not at all John, I’d be delighted if more people took the time and effort to try and verify their assumptions – particularly with regard to the height of the contrails. However, in this case, the distinction between a KC-135 and a 747-400 is vitally important to the final figures. We agree on everything else, but the identification of the plane has to be correct to calculate the height – hence it’s the major issue here. You can’t simply say you don’t care, because that’s like saying you don’t care how high the plane was. If someone would describe in detail or post a video that shows something that is clearly not an aircraft leaving contrail is ice-saturated conditions or not, and not a fire fighting operation, crop dusting, and so on, then I would be willing to concede that chemtrails might be real. Similarly, if someone were to sample what some suggest is a chemtrail and find something other than ice and jet engine exhaust constituents. The irony of that situation (sampling a “chemtrail”) would be that the aircraft doing the sampling would itself be observed to be “laying down the chems”. No doubt this has been pointed out to those that may have made genuine inquiries with some capable operator, and they have gone off the idea. I suspect this is why it has never been done. I am an ordinary person with no agenda here. I am ready to take anything on board provided there was some credible evidence to support it. You seem to have the perfect, pat answer to every question that is presented regarding chemtrails, too pat in my opinion but I’m just one of those crazy chemtrail people I guess. I don’t know anyone who has mistaken fire fighting operations or crop dusting for aircraft allegedly spraying at 30 plus thousand feet, I think that’s just a ridiculous statement by you, aircraft used for fire fighting and crop dusting are used at very low altitudes and all the reports on chemtrails that I have seen to date, without question refer to it as being done at high altitudes. Regarding “sampling of trails”, you know, or maybe you don’t, that to do something like that, it must be permitted by the FAA before it could take place, could or would a permit be issued is anyone’s guess but I have fair idea it would be an expensive, woefully long drawn out process. I’ve read about people who would like to do this but I assume that it is cost prohibitive for them to do so, I don’t believe that the average person has a clue as to how much it cost to hire a sampling equipped aircraft from a company, plus pilot and technicians to do the sampling, plus you have to have some idea of what to sample for, then there will be the lab cost, we are talking lots of thousands of dollars here. Since you seem to think that air sampling would bring about some definitive answers, perhaps out of pure unbiased scientific curiosity, you could put up the funds to accomplish this sampling and post the results here for all to see. I’ll even help you and put in $20.00 towards the cost. A friend of mine that lived close by is an avid believer in the chemtrails and he has shown me some photos that are time and date stamped along with screen captures of a flight tracking program called Flightaware, it’s really odd because the planes and trails being made in the photos don’t show up on the Flightaware program,they should if they are only normal commercial flights, right? He says that occasionally a company aircraft will have its transponder blocked for security reasons but airlines and cargo carriers do not block their aircraft from being tracked,so,when dozens of untracked aircraft are being seen and photographed in an area but they are not showing up on these civilian tracking programs, what do you think is going on? Just so you know,I’m not talking about planes over MOA’s but over populated areas, far from any MOA. I’m sorry but I do not have the links to his material offhand, I know he posted it on Flickr and a couple of other sites but I don’t know where, I’ll see if I can get that information from him for you and post it because it’s really interesting. I’m sure you will have an answer as to why groups of aircraft are flying around untracked and unidentified making these long lasting trails when the RH at flight altitudes is well below the 60% necessary for them to form. My friend pointed that out to me as well, along with the ADDS data that showed there was no Ice Saturated air at flight altitudes. I’ll make a point of seeing him tomorrow because he knows a lot more about this chemtrail stuff than I do or ever will, what I do know is that there is definitely something going on in our sky’s that has nothing to do with normal air traffic. I know, I know, talk is cheap so I’ll leave it here but I’ll be back with that info, count on it. So, people do make that mistake. I’ve got no incentive to spend any money sampling the trails. I think, with 99.999% confidence, that they are contrails, and so will just show ice and other components of aircraft exhaust. If they show this, then my money will be wasted, as it would prove nothing, as the theorists would undoubtedly say I would have to sample a lot more trails to be sure. That’s why the responsibility lies with the claimant to prove their claims. All YOU have to do is find ONE chemtrail, and your theory is proved. Me finding one normal contrail would prove nothing. So go ahead. 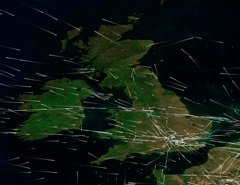 Regarding Flightaware, it’s quite tricky to match planes there to the planes in the sky. They don’t always show the flight info on every frame, as where two planes overlap they only show one set of info. So on any given frame you only get info for less than half the planes or less in a busy area (see example below). It’s best to take two synchronized videos, one of the sky, and one of the flightaware window. However, if you’ve got some actual evidence, then I’d be happy to take a look at it. I just thought I’d mention it because you seem to be as adamant about how there is nothing being sprayed as those that believe that there is something being sprayed, you are making an opposing claim without any proof to back it up, therefor it is you who are the claimant regarding you’re position, I could just as well say that the burden of proof lies with you regarding you’re unproven claim, in fact, you are offering less in the way of viable proof regarding you’re claim than those who believe that there is validity to this spraying issue, at least they offer a great number of combined observations of anomalous activity along with videos and photographs the likes of which can not be found prior to the 1990’s. The claim you put forward is your responsibility, not someone else’s, obviously those on the chemtrail side of it can not provide such expensive sampling and you know it but please don’t use there inability to afford such testing to keep you from proving your claim, that’s something that only a hypocrite would do. And please,don’t hand me that old line about W.W.II bomber contrails over Europe, no one ever saw constant, concentrated bomber contrails over the U.S. during that era of our history of the type we have constantly seen being made here since the1990’s, that W.W.II bomber contrail argument falls very short of convincing anyone that at least some of what we are seeing taking place in our skies today can be attributed to just normal contrail’s made by normal plane traffic. 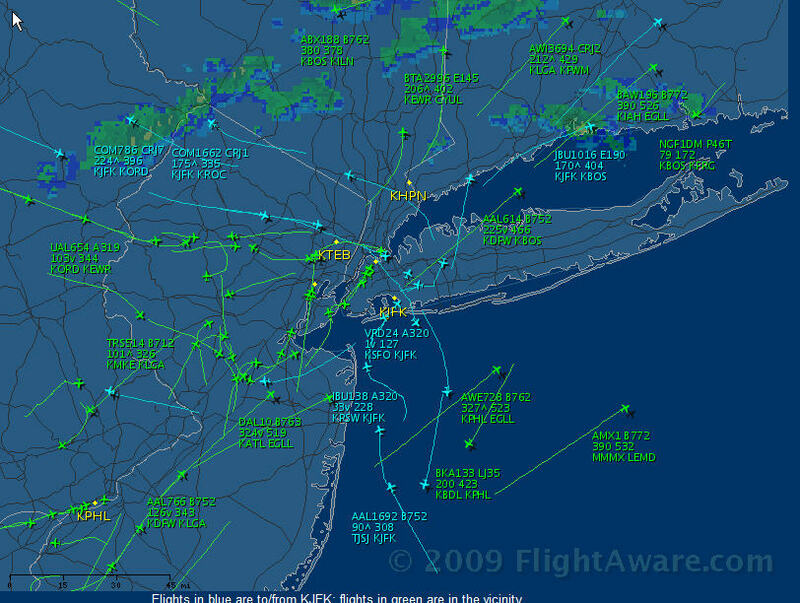 I couldn’t reach my friend yesterday regarding the Flightaware stuff he has, seems he was not home but then I see you have already started to preemptively debunk the Flightaware tracking program data without even seeing what my friend has saved from it, that’s really rich, you say that you do not have an agenda here but then you debunk Flightaware at the mere mention of it’s name, a tracking program that other notorious debunkers have actually suggested that people use in order to see the normal flights that you insist are leaving normal contrails that we perceive as chemtrails,you debunkers can’t have it both ways. I have studied the Flightaware program FAQ and I have tested just how accurate the program is myself , it has to date been very accurate in reflecting exactly the number of planes flying in my area, the only thing is, there is a slight delay, five minutes or so in the data showing up but it shows all of the traffic in the area that is coming and going quite accurately. It is the traffic that does not show up that presents the obvious question. Since you have already debunked the use of Flightaware before even seeing what it is my friend has, I see no reason why I should bother my friend over it, I would venture to say that you would only find a way to debunk what he has saved from it,as far as I can see, the only thing that you can prove here is that you are a debunker and all that you ever will be regarding the chemtrail issue. My friend would tell me that I am wasting my time at a site like this and I can see how he would be right about that, I can’t be bothered with such a closed mind as yours and I don’t believe that it would be mentally healthily to continue with any further discussion on the subject with you. Indeed, which is why I back up my claims with a large number of historical documents, photographs, videos, scientific papers, newspaper articles, science books, weather books and encyclopedias – all of which agree that contrails persist and spread, and have done since planes were invented. All of this is found on this site, with references to original sources. To back up your claims, you have the following evidence: “I don’t remember contrails looking like this”. And based on this disparity of evidence you think I should hire a fleet of private jets to sample hundreds of contrails? Perhaps first you could try to redress the balance. What evidence do you have, besides eyewitness accounts, that contrails were any different before 1999? Do you then claim all the science books, articles, etc, are all fake? I’m sorry, but if you had evidence, then it would stand up to scrutiny. I’m afraid that claiming you have evidence, and then not showing it because it will be debunked, is not really helping your case. I’m not convinced this method of measurement is very accurate at all. To confirm it, I would like to see tests done with different types of planes at different known altitudes and the results from the camera measurement method. 1. Most cameras are storing their images in a compressed format (usually JPEG). The compression artifacts in the pixel data can be seen usually even without zooming in. Right away, this distorts the accuracy of the photo. 2. 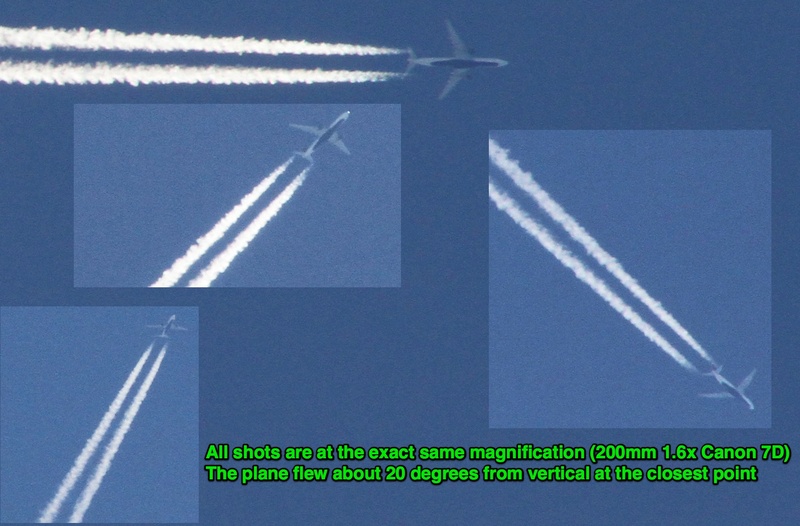 Most of the chemtrail pictures that focus on the plane doing the “spraying” are highly zoomed in on the plane. Judging by the quality of the pictures, I can say that most of these cameras are probably in the $100-$400 range, and therefore do not have a sufficient optical zoom. Digital zoom merely enlarges the pixel data of the area you are zooming in on, interpolating the data the way the camera thinks it should be. While digital zoom algorithms have definitely improved over time, the pixels that are produced are still nowhere near as accurate as an optical zoom. By the way, this phenomenon is even worse when the picture is simply blown up on a computer. Photoshop has some fairly high quality enlargement algorithms, but there are a few different choices and each one produces different results. This is a picture showing subpixel rendering, but is also a great example of how different methods of enlargement can produce different results. There are more variables too, but those are the most relevant ones to this discussion. Given the two facts above, you can see that it is almost impossible to accurately determine WHICH pixel really represents the edge of the plane. Now.. let’s assume you can determine the edge of the plane within 1 pixel accuracy. What effect does one pixel have on the end result? Difference between high/low values with only 1 pixel variation from stated pixel width: 663 ft. Seems to me like thats a pretty big difference, considering air conditions can change drastically in that amount of space. Also.. another reason this is such a big difference, is that if I’m not mistaken (not an atmosphere expert by far), the tropopause is right around that area of the atmosphere depending on conditions and latitude etc, so those 663 feet could really have a huge effect on the qualities of the contrail you’re observing. Chromatose, I totally agree with your calculations and discussions of pixel accuracy. However I never really though of it as being particularly accurate. For the discussion above it’s more than sufficient to demonstrate if a plane is roughly around 20,000 feet or 30,000 feet. I think you can get accurate to within a few hundred feet with a reasonably good camera. And there’s not much benefit to anything other than that. Here is a different way to measure the height of persistent contrails. In the satellite photo below, there are three long contrails casting clear shadows on the ground. The Sun azimuth, estimated by sliding photo relative itself so that to superimpose the contrails with their shadows, is about 150 degrees, meaning that the time of the day is about 10 a.m. The Sun altitude at the time and date in this place is about 27 degrees. Using Google Earth, the displacement of shadows relative the vertical projections of contrails is about 21.5 km, that gives the contrail heights being about 21.5 tan(27deg) = 11 km = 36,000 feet. Very interesting. What did you use to get the sun’s angle? Is there an on-line calculator? I have used SunPosition Calculator (http://sunposition.info/sunposition/spc/locations.php). The choice of locations is limited for unregistered users, so I have selected Hollywood Sign as the nearest. In the above satellite photo, the right hand part is taken at a significantly later time than the rest of image. In its bottom corner (south of the Mexican border), there are a couple of linear forked clouds (probable spread contrails), also casting distinct shadows on the ground. The same method as above gives the sun azimuth of 200 deg, the sun altitude of 34 deg and the displacement of shadows of 14 to 16 km (variations are probably due to different elevations of the ground). This again gives the contrail heights in the range of 9.5-10.8 km (31,000-35,000 feet). The metadata on the composite satellite image above show that the eastern part pictures were taken at 17:30 UST and the western part pictures at 19:05-19:10 UST. These times are very different from the estimated one, therefore my above method of measuring the heights of contrails from satellite images is obviously flawed. The flaw is that the actual location of contrail is not there it seems, but may well be miles away from the location of contrail image. It is because the contrail image is the projection of contrail from the position of satellite camera, in the same way as the contrail shadow is its projection from the sun. However, the actual location can be inferred from the sun azimuth and the azimuth of the satellite. The true sun azimuth (and altitude) at a given location at the time when its picture has been taken can be readily calculated. The data to calculate the azimuth of the satellite are probably also available, but I haven’t found yet, where to get them from. Anyway, the satellite azimuth can be inferred from the metadata photographs. 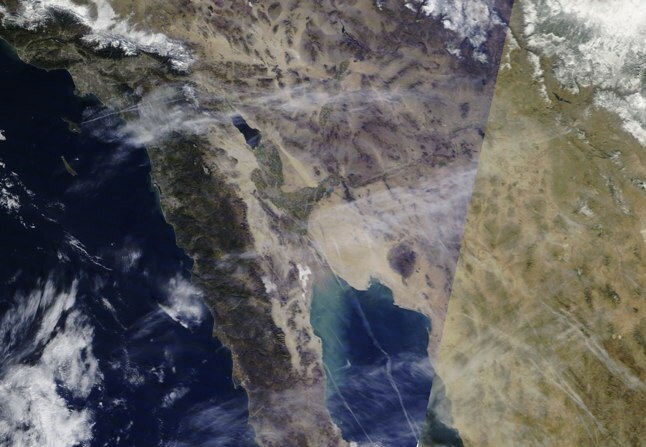 The picture below is a clip from the above satellite image (right-hand bottom corner). The green line connect corresponding points of the contrail image and shadow. The red line is the sun azimuth (about 155 deg at 10:10 local solar time; the sun altitude is about 32 deg). The blue line is the satellite azimuth (about 95 deg). The cross-point of the red and blue line is the actual location (vertical projection) of the corresponding point of contrail. The magenta segment gives the distance between contrail and shadow, 14.8 km, from which the height of contrail is 14.8 tan (32 deg) = 9.3 km. Adding to this 0.9 km of ground elevation, the height of contrail is 10.2 km = 33,500 feet. The yellow segment gives the distance between the contrail and its image, 15.8 km. From it and the contrail height, the satellite azimuth is arctan (9.3/15.8) = 30 deg. This is about right: the contrail location is near the edge of swath, more than 1,000 km away from its middle, whereas the satellite orbits Earth 870 km above the ground. In the last paragraph of the previous comment, instead of “satellite azimuth” read “satellite altitude”. Isn’t “azimuth” correct, as you are referencing an angular measurement? So maybe you mean “elevation”, not “azimuth”? Yes, I mean the elevation (el) angle, also called the altitude, according to your link. I have encountered the latter first, looking for a proper English term. Surprisingly, the elevation angle of the satellite is quite low for some areas of the composite satellite photographs, projecting contrails to the ground ten miles away from their actual locations. It run along the Dutch and Belgian coast in a strip of about 400 km long but less than 40 km wide. In its middle part, there was a ladder-like grid, casting a distinct shadow on the sea surface. The superposition of ladder pattern on its shadow by sliding the picture relative itself gives a very good match. The same operation also superimposes the other contrails in the strip onto their shadows. This means that all contrails in this area are roughly at the same altitude. I have applied the revised method to measure the height of contrails in this area. A the time of the photo, 11:05 UTC, the sun azimuth and altitude were 170 deg and 16 deg, respectively. The satellite azimuth, 285 deg, is deduced from the direction of parallel lines on the sea surface, the artifact of composite image assembly. The distance between the actual location of contrail and its shadow is 31.3 km, thus the contrail height is 31.3 tan(16 deg) = 9 km = 30k feet. The distance between the actual location of contrail and its image is about 3.8 km, giving the elevation angle of satellite: arctan(9/3.8) = 67 deg. this area was clear. The contrails were blown inland by wind and/or dissipated. I assume that you are in Montana. Have you considered that a lot of new jet routes have opened over Montana over the years? Especially the long distance jet route? So you would see contrails that you would not see at all decades earlier. Brent- Montana was and is still called “Big Sky country” not for lack of cloud cover but for the wide open vistas that allow one to see great distances. Its based on geography not cloud cover.